Apostrophe Catastrophes: Happy National Punctuation Day Eve! Happy National Punctuation Day Eve! Readers, tomorrow is an exciting holiday we've all been waiting for: National Punctuation Day. Click here for ideas on how to celebrate. As you know, I celebrate National Punctuation Day every day. 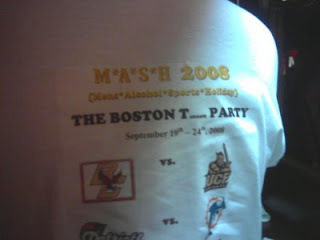 For instance, on Saturday my friends and I met some Canadian tourists in a bar and we felt compelled to inform them that their t-shirts were missing an apostrophe. "Mens is not a word," Mollie told them. In their defense, Men's Alcohol Sports Holiday (M*A*S*H) is a clever acronym, and they had cute accents, eh? National Punctuation Day was founded by Jeff Rubin in 2004. Let me know how you choose to mark the occasion. Two years ago on this day, clearly in celebration of National Punctuation Day, it was reported that George Bush said that the war in Iraq would be "just a comma." BLITZER: Let's move on and talk a little bit about Iraq. Because this is a huge, huge issue, as you know, for the American public, a lot of concern that perhaps they are on the verge of a civil war, if not already a civil war…. We see these horrible bodies showing up, tortured, mutilation. The Shia and the Sunni, the Iranians apparently having a negative role. Of course, al Qaeda in Iraq is still operating. BUSH: Yes, you see — you see it on TV, and that's the power of an enemy that is willing to kill innocent people. But there's also an unbelievable will and resiliency by the Iraqi people…. Admittedly, it seems like a decade ago. I like to tell people when the final history is written on Iraq, it will look like just a comma because there is — my point is, there's a strong will for democracy. We should, of course, celebrate the comma on National Punctuation Day. And we should be glad, I suppose, that an entire footnote won't have to be dedicated in history books to the sectarian violence in the Iraq War. I sure thought so. I can't decide which part shocked me more: the comma comment, or the implication that the sectarian violence that has characterized the aftermath of the war (remember "Mission Accomplished"?) will be insignificant enough not to include in the history of the conflict. I don't mean to get political, and I apologize for inserting politics into punctuation. But what Bush implied a comma was capable of is not found in any style manual, punctuation guide, or grammar textbook I can find. Strunk and White? Silent on the issue of a comma being capable of noting history. Lynn Truss? Not a peep. The Chicago Manual of style? The MLA Handbook? Nothing. I'm thinking it will take an Executive Order for this to happen. Mr. Bush is not loath to issue Executive Orders. I wonder if the order has already been issued, and the unsuspecting English-speaking public in simply unaware, on account of National Security or something? Ready to Count the Errors in this Sign?